Paul DiMaggio on the Internet's influence on culture - "Ch@nge"
Who would have imagined that the new genetic revolution of the 21st century would be born in a pond designed to harvest salt from seawater? In the salt flats of Santa Pola (Spain), the study of a microbe led to the discovery of the CRISPR/Cas9 system, the best tool existing today to cut and paste DNA fragments and the great promise of gene therapy for this century. None of this was in the mind of the microbiologist Francisco Martínez Mojica at the University of Alicante when, in 1990, he was studying why the concentration of salt affected an archaea from those salt flats in a certain way. The so-called Haloferax mediterranei responded differently to the restriction enzymes, which cut the DNA by specific sequences and which are common tools in all molecular biology laboratories. When looking for answers in the genome of this and other archaea, Mojica observed some DNA sequences that were repeated, separated by heterogeneous spacers. The intrigue over these sequences increased when Mojica discovered similar ones in a score of different microbes, to which were added other cases found by different researchers. In 2002, Mojica suggested a name for these mysterious pieces of repeated DNA: CRISPR, or Clustered Regularly Interspaced Short Palindromic Repeats. The genes close to these sequences, which were assumed to be related to them, were called genes associated with CRISPR, or Cas. 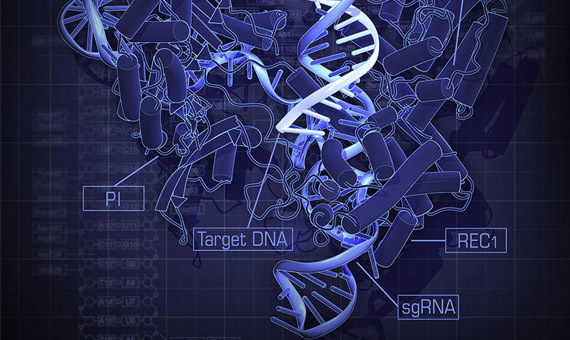 The CRISPR/Cas system now had a name, but its function was still a mystery. It was then that Mojica had the brilliant intuition that would lead him to solve the enigma. Instead of focusing on what all those sequences had in common, the repetitions, he decided to look at what differentiated them, the spacers. When studying one of them in the bacterium Escherichia coli, he discovered that it was identical to a segment of the genome of a virus called phage P1 that infects this bacterium. Or that should infect it, since that E. coli specifically was immune to P1. Following this promising thread, the researcher checked the spacers of thousands of other CRISPRs in different microbes, noting that in all cases they corresponded to sequences of infective DNA, but that they always appeared in bacteria immune to those infections. Thus, Mojica proposed a plausible, but risky hypothesis: that the CRISPRs represented an adaptive immune system of the bacteria that collected pieces of DNA from its attackers to recognize them in the future and eliminate them. So daring was the idea that Mojica’s study was rejected without review by the journal Nature, and later by others, until in 2005, after a long process of corrections, it was published in the Journal of Molecular Evolution. Shortly after, French researcher Gilles Vergnaud and his collaborators proposed a similar hypothesis. But the bacteria’s immune system was still an exclusive concern of microbiologists and CRISPR/Cas was still far from launching the genomic editing revolution. The breakthrough came when it became known how bacteria use the CRISPR/Cas system to rid themselves of viruses. 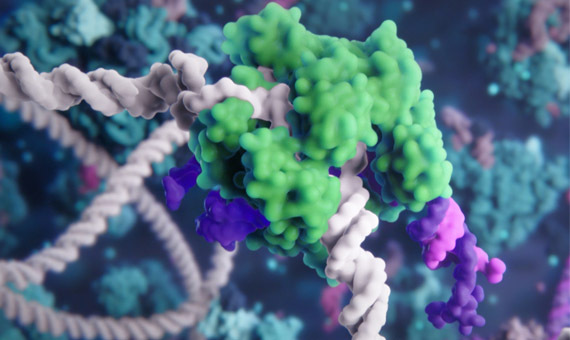 Cas genes make enzymes that cut DNA, while CRISPR spacers produce RNA molecules capable of recognizing their twin sequences in the viral genome. The RNA and the Cas enzymes travel together, so that the former act as a guide to indicate to the latter where they must cut to disable the virus. Understanding that those molecular scissors could be modified to cut any DNA sequence, American biochemist Jennifer Doudna and French researcher Emmanuelle Charpentier simplified and redesigned the CRISPR system of the bacterium Streptococcus pyogenes to build the CRISPR/Cas9 tool, which was later optimized and tested in human cells by researchers Feng Zhang and George Church. The system is completed with a fragment of DNA that acts as a mould to repair the broken ends and that allows for the insertion of the desired sequence, for example the correct version to restore a gene. The cellular repair machinery itself handles the final bonding. CRISPR/Cas9 is not the first genetic cut and paste tool available, but it has brought great advantages over other systems: “Fundamentally, the ease with which the system can be programmed to direct it to the target where it is intended to act,” summarises Mojica for OpenMind. “In the case of the other tools, you have to introduce multiple modifications in the sequence of proteins, an arduous and expensive job, whereas in the case of CRISPR you only have to synthesize a small molecule of guide RNA, cheap and easy to design, and while the Cas9 protein is used as is.” In addition, adds the researcher, CRISPR/Cas9 can act on multiple genes at the same time. Over the years, new modifications and versions have been added to the original system. “There are other Cas proteins, such as Cas12, previously called Cpf1, which are also being used in editing,” says Mojica. However, this technology still has limitations. The researcher emphasizes above all the risk that Cas fails by defect or by excess. If it is a matter of repairing a damaged gene, it is essential that it be done correctly in all the cells, but without cutting anything that should not be broken. Another challenge Mojica aims to achieve is a system that allows CRISPR/Cas9 to be administered directly to patients. It has already been used successfully to repair genes in human embryos. In China clinical trials have begun, and soon the first tests with an ex vivo use will begin in the US and Europe, i.e. extracting cells from the patient and repairing their genes in vitro and then returning them to the organism. This approach will be tested for blood diseases such as beta thalassemia or sickle cell anaemia. However, the dream in everyone’s mind is an injection that heals defective genes, and for this a good in vivo transport system is still needed. “Gold nanoparticles are being used successfully, for example, to overcome this problem,” Mojica concludes. CRISPR-CAS: More than Just "Scissors"
The Rorschach Test: Science or Pseudoscience?